Marietta, PA – Governor Tom Wolf today visited Marietta, Lancaster County, for a walking tour of areas along the Susquehanna River to see how recurring flooding is affecting the area and to discuss how his Restore Pennsylvania plan can help alleviate this ongoing problem for the many homes and historic properties in the borough. Gov. Wolf visited McCleary’s Pub and historic Shank’s Tavern, which have both survived numerous floods but with hundreds of thousands of dollars of damage, before walking along Front Street to the Marietta Boat Club where he met with guests and residents to outline his Restore Pennsylvania plan. 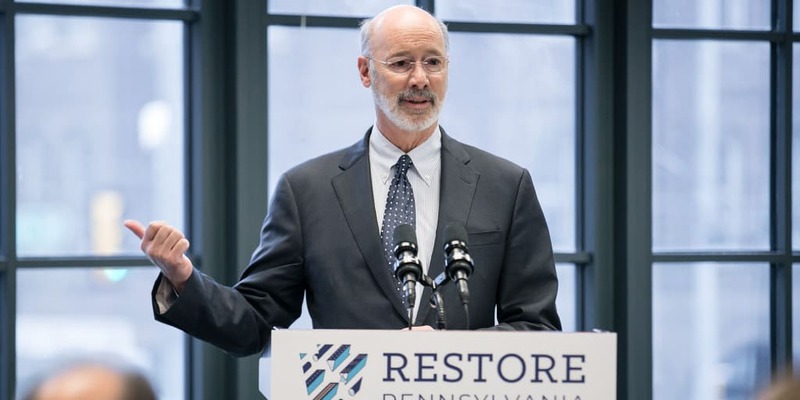 Restore Pennsylvania will provide funding to help towns and cities prepare for flooding and severe weather, upgrade flood walls and levees, replace high-hazard dams, and conduct stream restoration and maintenance. It also will establish a disaster relief trust fund to assist individuals who suffer losses that are not compensated by the Federal Emergency Management Agency or other programs. Restore Pennsylvania would be funded by the monetization of a commonsense severance tax and will invest $4.5 billion over the next four years in significant, high-impact projects throughout the commonwealth to help catapult Pennsylvania ahead of every state in the country in terms of technology, development, and infrastructure.